THE APPAREL MARKET — unlike, say, the rod and reel business — has one foot on the fashion aisle and one foot in the R&D department. Consequently, there are always new products in pipeline, but many times we see only changes in cut or color over last year’s models. For 2010, the manufacturers have given us a mixed bag; some new technology is present here, while other models simply rejigger old designs. 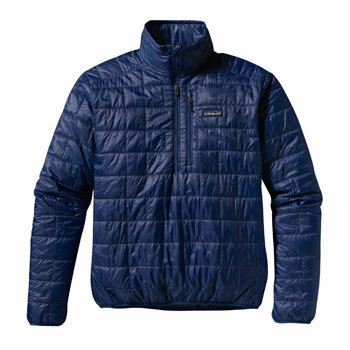 Patagonia simply makes great products; they are very good at stretching ideas that work into new, useful shapes. The new Nano Puff Jacket ($150)is a great example: take the popular Micro Puff lineup, and then reduce the stuffing, while adding a quilted pattern to hold everything in place. The result is an attractive, useful light shell that will look just as good on the river as on the football field. Our only objection was to the “bricklayer” stitch pattern on the men’s model, which is a bit mesmerizing if you stare at it too long. Last year’s Hellroaring Jacket was one of our reviewers’ favorite products; we particularly liked the Cloudveil jacket’s simple cut and the stretch fabric (and, incidentally, the lack of a hood). This year’s Hellroaring Jacket is the same price ($200), but comes in a darker shade of green. It now sports radio-welded pocket seams for a more technical look… and it has a hood. With both models now available in fly shops, anglers have their choice. Cloudveil also announced two new hardshell jackets: the Snake River Pro ($450) and the Riffle ($300). Each is a fully featured wading jacket with large pockets; the Snake River model is made of a more rugged Gore-Tex material, while the Riffle sports lighter-weight proprietary fabric. 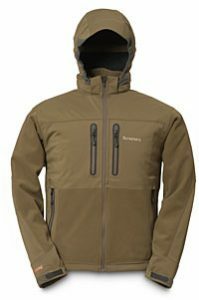 In our minds Simms significantly improved last year’s Guide Windstopper Jacket with a redesign that makes it beefier and more appealing all around. The fleece inner layer offers excellent warmth and breathability, while the removeable hood, collar, shoulders, back of sleeves, front side panels, hem and cuffs feature water-resistant WINDSTOPPER® Soft Shell fabric for rugged, abrasion-resistant durability in high-wear areas. Besides all that, the jacket looks just wickedly cool in charcoal black. (We’ll provide a picture of the black as soon as we can get our hands on it.) On the fabric-treatment front, Simms spent a lot of effort at the show demonstrating the effectiveness of their new No-Fly Zone fabric (they even had two researchers from Burlington, who manufactures the fabric for them, baring their arms to hundreds of mosquitos). 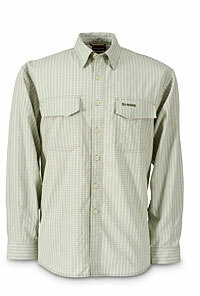 The new treated fabric will be used in the stylish Bug Blocker and Fly Away lines of shirts (both $89.95). L.L. Bean is known for its excellent “cost-to-benefit ratio” — the products are often way better than you’d expect for the price. This year’s $79 Emerger wading jacket is a great example. 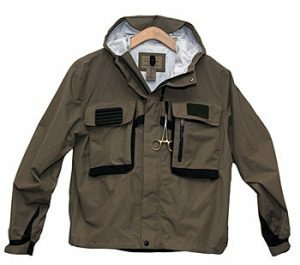 Though only single-layered, this jacket has all the hoods and pockets you’d expect on much more expensive fishing shells, with the added advantage of being packable. Waterproof, windproof and breathable. One new entry at this year’s show got a lot of buzz for a relatively simple set of products: RailRiders technical pants ($59 to $89) come in a variety of shapes and forms, but most follow a similar template. These breathable, high-end drawers have reinforced knees, cinchable cuffs, and a rugged hiker’s look that was very popular at the show. (By the last day, several showgoers were already wearing them around the floor).